We offer a huge assortment of PP Woven Fabric that is widely used from mix packaging and wrapping in industries like sugar, fertilizer, detergent and cement. Made from the finest grade polypropylene, the PP Woven Fabric is known for its high strength, wear & tear resistance as well as durability. We also have in house lamination facility for laminated PP Woven Fabric. 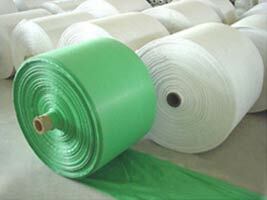 We offer a comprehensive array of PP Woven Fabric in varied sizes and specifications at pocket friendly prices.